Welcome to Wellington! Stay in the heart of Wellington's CBD and the major shopping area. Find yourself just minutes away from the Beehive and other Government buildings, the Waterfront, Queens Wharf Events Centre, Te Papa Museum. David Jones Shopping and the must-do Wellington Cable Car are both just a lift away across the road. This Two Bedroom Apartment Suite is ideal for families, business travelers, couples or larger groups. We welcome young families with well behaved young children too. It is perfect is you are looking for a home away from home experience, with full kitchens and laundry facilities. The relaxed living area contains a 2-seater Couch, a Sofa Bed, LCD TV with Freeview. 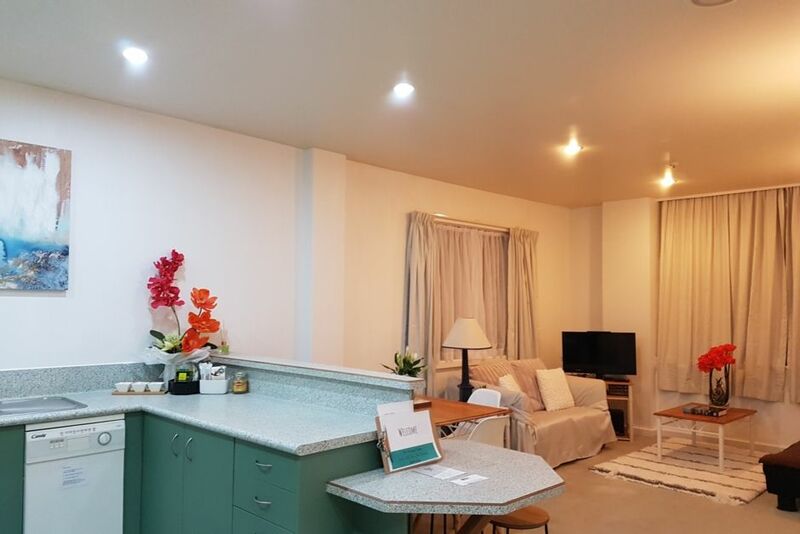 A fully equipped kitchen featuring an oven, cooktop, microwave, fridge and dining table to prepare your meals and have some quiet time in the apartment. First bedroom is relatively good sized and has a queen bed. The second bedroom has a Double bed and is on the cute and tiny side; it is an internal room but it gets natural light from the window above the door that opens to the dining / living area. The lounge has a sofa bed. There is a convenience store right at the Ground level, and the bigger Supermarket is just a lift away across the road. Restaurants and Cafes abound in the area. There is abundant pay parking available in the area and a public car psrk right behind the building. Street parking is free from 6pm-8am, Fridays free from 8pm. It is free on weekends but with a 2 hour cap (you would need to move your car to another space every after 2 hours). Checkin: We will meet you personally to check in, but an alternative option will be given in case we are not available to do so. The must-do Wellington Cable Car has its station just also a lift away across the road. The waterfront is just a stroll away. - We have high regards for our great neighbours in the apartment, as such, it is of great importance that their privacy and peace is maintained throughout your stay. Please, NO PARTIES and NO LOUD NOISES. - Please leave the unit clean as you found it: dishes washed, furnutures in original places and rubish put away nestly in the bin. Nice host, everything as expected. Very comfortable. We enjoy our stay in this apartment . Very convenient location with just a short walk to many attractions and transport. A comfortable and enjoyable stay. Highly recommend. The owner is a very efficient operator and a pleasure to deal with. Great accommodation, very well equipped apartment. Very central location and easy to access everything by foot.. I can't thank Grace and Francis enough as they went out of their way and delivered the keys around 130am as our flight was delayed. We were very happy with the facilities & location. Only small issue we had was the door to the bathroom, its a very small space. Hi Leanne, thanks for letting us know that you were very happy with your stay. Your feedback on the bathroom door is much appreciated - we realise that this is due to the door stopper not ideally positioned. We'll have this sorted out soon to allow the bathroom door to open much wider. Thanks! WONDERFUL location, so central to everything we wanted to see and do in our very short stay. WONDERFUL location, so central to everything we wanted to see and do in our very short stay. The apartment was very welcoming, with lots of little details taken care of - milk in the fridge, tea/coffee/hot choc, first aid kit in the bathroom (which we unfortunately needed! ), toiletries provided. Lovely and warm in this freezing weather, easily the best bookabach we've stayed in.